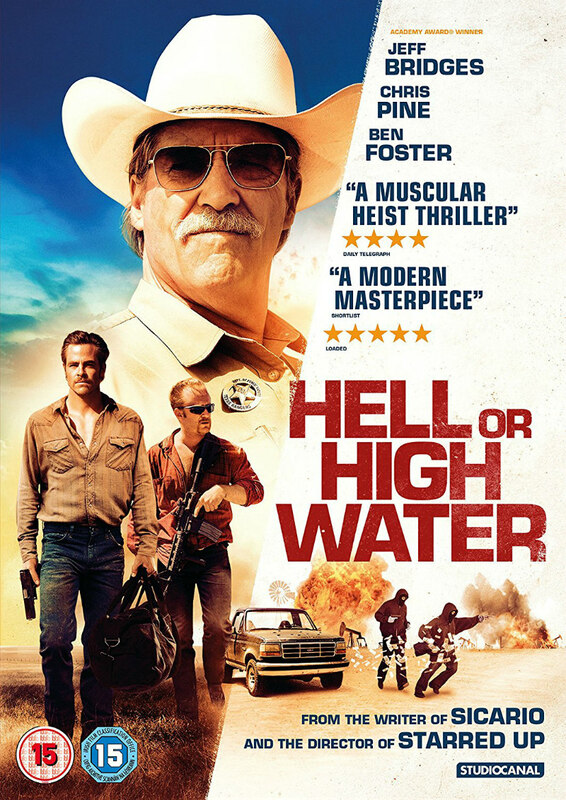 Did You Win HELL OR HIGH WATER On DVD? Hell or High Water comes to UK DVD January 9th, and we've got three DVDs to give away to UK readers. From acclaimed director David MacKenzie (Starred Up) and writer Taylor Sheridan (Sicario), comes this year’s most exciting and powerful thriller, Hell or High Water. Starring Chris Pine (Star Trek, Jack Ryan: Shadow Recruit), Ben Foster (The Programme, Lone Survivor) and Jeff Bridges (True Grit, Crazy Heart), Hell or High Water arrives on digital download on January 2nd, and on Blu-ray & DVD on January 9th, 2016. Texas brothers Toby (Pine) and Tanner (Foster), reunite after years apart to rob branches of the bank threatening to foreclose on their family land. For them, the hold-ups are just part of a last-ditch scheme to take back a future that seemed to have been stolen from under them. Justice seems to be theirs, until they find themselves on the radar of Texas Ranger, Marcus (Bridges) looking for one last grand pursuit on the eve of his retirement, and his half-Comanche partner, Alberto (Gil Birmingham; The Lone Ranger, House of Cards). As the brothers plot a final bank heist to complete their scheme, and with the Rangers on their heels, a showdown looms at the crossroads where the values of the Old and New West murderously collide. Following its premiere at the Cannes Film Festival in May, the film has received universal acclaim, with the intense actions sequences and flawed yet relatable central characters creating the perfect modern western, as the gun-slingin’ brothers rampage through small town Texas. The combination of director David MacKenzie’s gritty tone and writer Taylor Sheridan’s screenplay filled with unrelenting tension and depth makes for one of the most gripping modern westerns in recent memory.